Looe is a small seaside resort located in south east Cornwall around fifteen miles from the centre of Plymouth. Looe is a busy fishing village and seaside resort - it is also a popular centre for recreational fishing and is regarded as the main base for shark fishing in the UK. 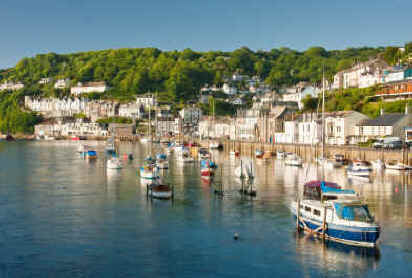 The village is divided into two, East and West Looe by the River Looe which is spanned by a famous seven arch bridge. The bridge was opened in1853 and replaced and earlier wooden bridge which had burnt down. By the mid-19th century Looe had developed into a major port which was involved in trading tin, arsenic and granite with France and the near continent. Fishing and boat building were also established at this time and Looe became an important centre for the pilchard fishing. 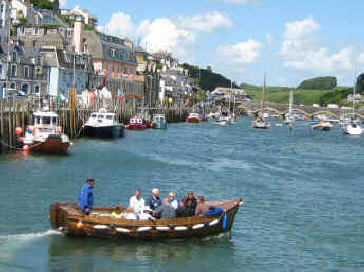 Present day Looe is a popular tourist destination with many visitors each year who are drawn by its charm and ambience. Looe offers beautiful sea views, narrow winding streets and quaint cottages and shops. There are also plenty of interesting pubs and places to try out the local seafood. There is a foot passenger ferry service between East and West Looe. 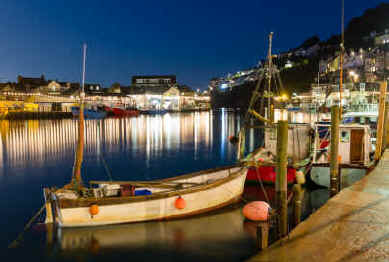 Looe is also well known as a centre for recreational fishing, visitors can hire a boat to go mackerel fishing or any number of other species. Trips are also available for reef or wreck fishing, booking in advance is advised. Looe is also home to the Shark Angling Club of Great Britain and you can arrange a trip to fish for these spectacular creatures. The most common catches are Mako and Porbeagle sharks and most of the sharks that are caught are tagged and released back into the sea. 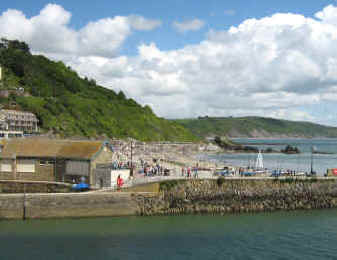 East Looe has access to a broad sandy beach and the famous Banjo Pier. Along the estuary you will find fishing boats landing their catch and several fish dealers. West Looe has many hotels, shops and restaurants and Hannafore beach which is stonier and narrower; Hannafore Point marks the end of Looe harbour. About two miles off shore is situated Looe Island which can be seen from a boat trip booked in East Looe. 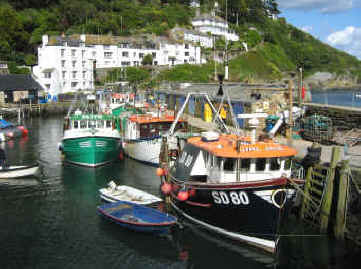 Just along the coast from Looe is Polperro; a tiny, picturesque, fishing village. The village is an appealing jumble of narrow streets and cute cottages overlooking a small harbour. The streets are so narrow that cars are banned from the village - a horse drawn wagon and an electric tram provide a link to the village from the main car park. In the past the main industry in Polperro was pilchard fishing but it is now tourism however some fishing boats are still based there. The village sits astride the River Pol which divides the village into east and west. There are many small cottages that are tightly packed along streets which wind up the steep hillside. The twisting, narrow streets are full of art and craft shops, small cafes and numerous interesting looking pubs. Well worth a visit! The coastline is magnificent and is part of the South Cornwall Heritage Coast and the South West Coast Path also runs along here. Fishing and boat trips are available from the harbour side. Looe Island - Boat trip from the quay. Looe Harbour Quay - Working fishing quay. Antony - 18th century house that was home to the Carew family - located near Torpoint.